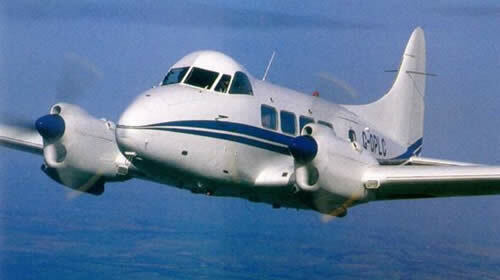 No matter how many times you've travelled by air, you just haven't experienced flight until you've flown in the Dove. Even if you love aeroplanes, let's face it: they are cramped, noisy, and uncomfortable. The exhilaration of the flight can be marred by restrictive views, uncomfortable seating positions, nowhere to put your stuff, turbulence......and we expect these things, we take them for granted, we believe them to be inevitable. It's much like travelling on the commuter train: we don't expect to enjoy the ride. Your flight is a ticket to a unique time warp experience. Every one of the six passengers in the art-deco cabin get an aisle and a window seat, giving a superb view along with a sense of how it was to travel the world in a 1930's airliner. It doesn't have to be that way. Instead of the 9.05 to Paddington, think Venice-Simplon Express! 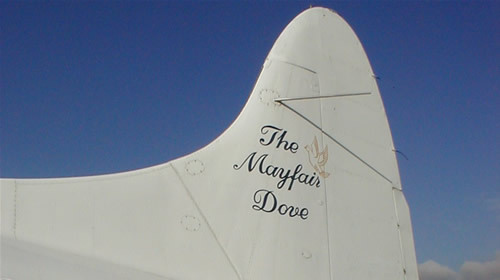 The Mayfair Dove carries up to six passengers in luxurious style, as you can see; and everyone has an unrestricted view of the panorama below; moreover, this famously stable aircraft is quiet enough to allow conversation at ordinary levels. 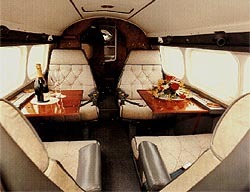 With highly qualified staff on board to meet your every need, this is flying as it was meant to be. The Dove is not only a classic of the air – it's in a class all of its own for comfort and convenience. Fly to Le Touquet for lunch, a day's shopping of just to mess around on the beach – we'll get you there in only an hour from Biggin Hill, without the hassle of check in or baggage reclaim; or charter the Mayfair Dove for a fishing or skiing trip: we've ample room and to spare for all your gear! See London as you've never seen it before, with one of our (day or) night flights, or take a trip along the South coast to remind yourself of the beauty of England – so easy to forget in a traffic jam! 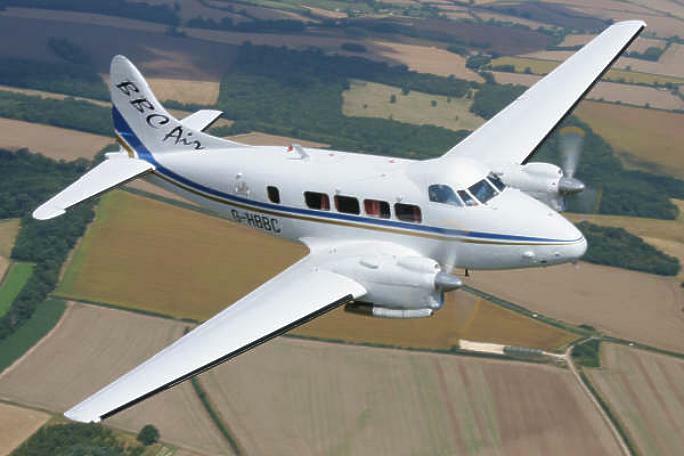 Availability: all year, day and night fully instrument rated. Flights4all is a trading name of Vouchers4all Limited, registered in England and Wales no. 10026630.